What is the element Oxygen as on the Periodic Table? Oxygen is a gas. It is a colorless, tasteless, odourless gaseous element that constitutes 21% of the atmosphere and is found in water, in most rocks and minerals, and in numerous organic compounds, that is capable of combining with all elements except the inert gases, that is active in physiological processes, and that is involved especially in combustion processes. It is the essential element in the respiratory processes of most of the living cells. The Atomic Number of this element is 8 and the Element Symbol is O. The name originates from the Greek 'oxys' for "sharp, acid", because oxygen was believed to be the key constituent in the formation of acids, and the Greek 'gen or genes' for "forming". 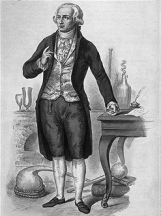 French chemist Antoine-Laurent Lavoisier originally thought that oxygen was an acid producer because by burning phosphorus and sulfur and dissolving them in water, he was able to produce acids. Elements can be classified based on their physical states (States of Matter) e.g. gas, solid or liquid. This element is a gas. Oxygen is classified as an element in the 'non-metals' section which can be located in groups 14,15 and 16 of the Periodic Table. Non-metallic elements exist, at room temperature, in two of the three states of matter: gases (Oxygen, Hydrogen & Nitrogen) and solids (Carbon, Phosphorus, Sulfur and Selenium). For additional facts and information refer to Oxygen Properties. Oxygen is by far the most abundant of all the elements. It occurs both in the free and in the combined state. In the free state it occurs in the air, 100 volumes of dry air containing about 21 volumes of oxygen. In the combined state it forms eight ninths of water and nearly one half of the rocks composing the earth's crust. It is also an important constituent of the compounds which compose plant and animal tissues; for example, about 66% by weight of the human body is oxygen. Oxygen constitutes 21 percent of the atmosphere. 1. Oxygen is essential to life. Among living organisms only certain minute forms of plant life can exist without it. In the process of respiration the air is taken into the lungs where a certain amount of oxygen is absorbed by the blood. It is then carried to all parts of the body, oxidizing the worn-out tissues and changing them into substances which may readily be eliminated from the body. The heat generated by this oxidation is the source of the heat of the body. The small amount of oxygen which water dissolves from the air supports all the varied forms of aquatic animals. 2. Oxygen is also essential to decay. The process of decay is really a kind of oxidation, but it will only take place in the presence of certain minute forms of life known as bacteria. Just how these assist in the oxidation is not known. By this process the dead products of animal and vegetable life which collect on the surface of the earth are slowly oxidized and so converted into harmless substances. In this way oxygen acts as a great purifying agent. 3. Oxygen is also used in the treatment of certain diseases in which the patient is unable to inhale sufficient air to supply the necessary amount of oxygen. Interesting information is contained in the following table of Medical uses of Oxygen, Health and Treatments. A useful reference providing information regarding the medical uses of Oxygen, associated health issues and disorders and treatments using oxygen. Ozone or Oxygen therapy is far more widely accepted in Europe than in the United States. Recent European research in ozone or oxygen therapy includes studies in the oxygenation of resting muscles, the treatment of vascular disorders, and the relief of back pain from herniated lumbar disks. In respiratory therapy oxygen is administered to increase the amount circulating in the blood. Lack of oxygen, as experienced during ascent to high altitudes or in certain illnesses, may bring on a variety of symptoms of hypoxia, or lack of oxygen. A number of poisons, such as cyanide and carbon monoxide, can disrupt the oxygen distribution system of the body. Such disruption occurs also in various illnesses, such as anemia and diseases of lungs, heart, kidneys and the liver. The discovery of oxygen is generally attributed to the English chemist Joseph Priestley, who in 1774 obtained the element by heating a compound of Mercury and oxygen, known as red oxide of mercury. 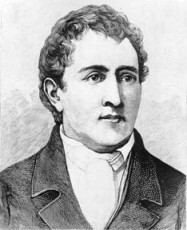 It is probable, however, that the German-Swedish chemist Scheele had previously obtained it, although an account of his experiments was not published until 1777. It was named by Antoine Laurent Lavoisier in 1777. Joseph Priestley (1733-1804) was an English school teacher, theologian, philosopher and scientist and a friend of Benjamin Franklin. 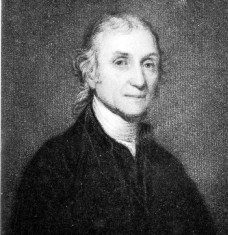 Joseph Priestley is credited as the discoverer of oxygen. He was a defender of the phlogiston theory and was the first to use mercury in a pneumatic trough, by which means he first isolated in gaseous form hydrochloric acid, sulphur dioxide, and ammonia. Check out Oxygen on the Periodic Table which arranges each chemical element according to its atomic number, as based on the Periodic Law, so that chemical elements with similar properties are in the same column. Our Periodic Table is simple to use - just click on the symbol for Oxygen as on the Periodic Table for additional information and for an instant comparison of the Atomic Weight, Melting Point, Boiling Point and Mass - G/cc with any other element. An invaluable source of facts and information as a Chemistry reference guide. The Standardised Periodic Table in use today was agreed by the International Union of Pure Applied Chemistry, IUPAC, in 1985 and now recognises more periods and elements than Dimitri Mendeleev knew in his day in his day but still all fitting into his concept of the "Periodic Table" in which Oxygen is just one element that can be found. These articles contain facts and information relating to Oxygen and each of the other elements including the Periodic Symbol, group, classification, properties and atomic number which is often referred to as the Periodic Table Number. Test your knowledge of chemistry and the Periodic Table by completing the Element Symbols and Atomic Numbers on our Blank Periodic Table. Chemistry students will also find a helpful section on Chemical Formulas. What is the Element Oxygen?